The William Warner house was constructed in 1780. William Warner was the “clothier,” of Warner’s Mill at the triple stone arch bridge that connects Ipswich and Hamilton on Mill Rd. William Warner, 3*, Capt William as he was known in later life, succeeded his father in the fulling business, and his son Stephen purchased the property from his brother William in 1829. 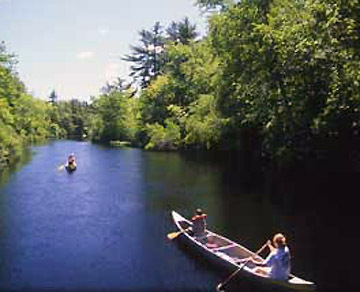 The road from the dam to Topsfield road was originally located west of Mill Rd. This house was moved from its original location near the bridge, and a section of the old road is now the driveway. Mill Road was laid out and accepted by the Town in Dec, 1817. 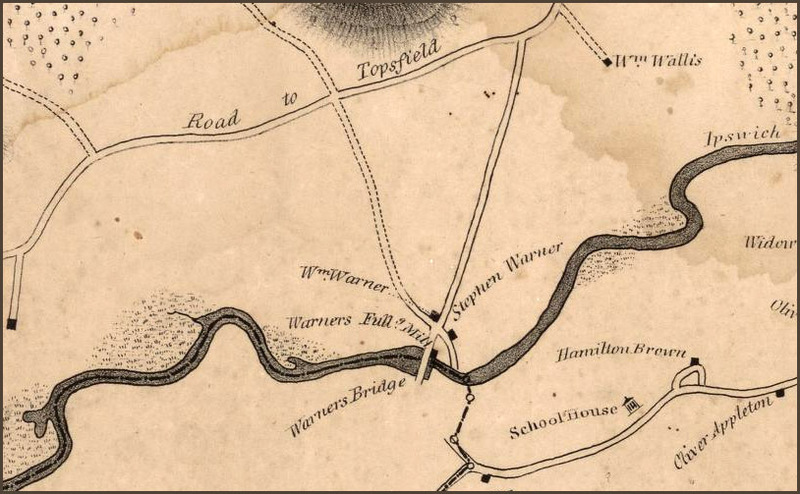 In the Spring of 1820, the Warners and others petitioned the Court of Sessions for a bridge. The Town opposed but the Court ordered it built. The Town then petitioned for a discontinuance of the road. Another petition was filed by the Warners in the following year with no better success. Five years then elapsed. The petitioners were as determined as the Town, and in 1829, they secured from the County officials a fresh order to the Town to proceed. The beautiful triple-arch granite bridge was built, but the Town voted in July, 1832, to employ Rufus Choate “and such other learned and respectable counsel as (the committee) may deem proper,’* to contest payment of any portion of the expense. The case went to the Supreme Court, which rendered an adverse decision in November, 1833, and assessed the Town $1498. Source: Ipswich in the Massachusetts Bay Colony by Thomas Franklin Waters. Closeup from the 1832 Philander map of Ipswich. Mill Rd. had been recently laid out, and the William Warner house sat at the intersection of Mill Rd. and the old road. The house was later moved further down the old road,which serves as its driveway.